JACKSON, Miss. (AP) — A one-time black nationalist was inaugurated as mayor of Mississippi’s capital city Monday, saying he wants Jackson to be a unified community where people of diverse backgrounds can make a living. Chokwe Lumumba (SHOW-kway Lu-MOOM-bah) said developers who do business in the city need to work with contractors and subcontractors who live in Jackson. The city has a majority-black population and most of its office-holders are African-American, but its economic power structure traditionally has been white. Lumumba said he will resist the type of development that would drive up the cost of living. “Gentrification is nothing but a war on the people who live in the city already,” said Lumumba, who was involved in a black nationalist group, the Republic of New Afrika, in the 1970s and ’80s, serving for a time as its vice president. More than 27 percent of Jackson residents live below the poverty level, and the city has hundreds of dilapidated or abandoned homes. The new mayor said he wants Jackson to attract new residents. “The aim is prosperity and security for every one of us,” he said. Lumumba, 65, is an attorney and served the past four years on the seven-member Jackson City Council. During the Democratic primary in May, he unseated Harvey Johnson Jr., who was mayor 12 of the past 16 years. Lumumba won the June 4 general election by a wide margin over three low-budget independent candidates. Johnson was Jackson’s first black mayor, and Lumumba is the third. Jackson is Mississippi’s largest city, though its population has dropped significantly in the past two decades as people have moved to the more affluent suburbs. The Census Bureau estimates Jackson had 175,561 residents in 2011; 79 percent were black and 18 percent were white. 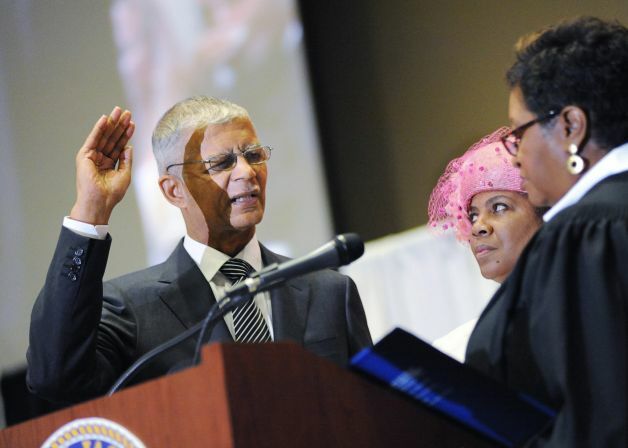 A diverse group of more than 2,000 people attended Lumumba’s inauguration at the Jackson Convention Complex, an angular contemporary structure that opened in 2009. It’s just two blocks west of the white-columned City Hall, which was built by slave labor in 1846-47 and was used as a Civil War hospital for both Union and Confederate troops. “Mayor Lumumba. I like the ring of that name,” Myrlie Evers-Williams, the widow of slain civil rights leader Medgar Evers, told the crowd. Medgar Evers was assassinated 50 years ago last month outside his Jackson home, by a white segregationist. “God has really blessed us with a history that makes us understand when things are wrong,” Lumumba said.